I like to make things quick and easy. I am a Mural artist at DIANA’S Murals and More in NY area. 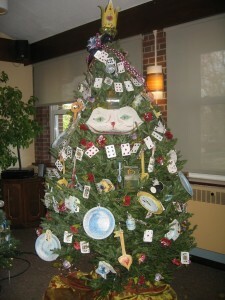 This season I was asked to design a Christmas Tree for charity, Festival of Wreaths and Trees. I’ve never done that before but was always fascinated by people who do. I’ve loved Alice in Wonderland story ever since I read it as a child. When I watched the movie recently with my kids ages 10, 11, I was so inspired the ideas came flooding in. My kids helped me with this project making it memorable and fun for all. In a matter of hours I had designed and created hand made decorations for my project. Most items were recycled. I used sponges to make cakes, water bottles for potions, disposable spoons, plates and cups were sprinkled with glitter for the tea party. The result was stunning. I was so pleased with the finished look. I made a connection with Salvation Army and at the end of the festival donated the Tree to a family with three kids. Sharing the joy with others made my holiday more special. I would love to share with anyone how to make Holiday decorations quick and easy.